There are times when I’m traveling, or even walking down the street in my own neighbourhood when I see something and get shivers. The beauty of it. The quiet of it. The intense feeling I get when I’ve witnessed something life-changing. Sometimes, more rarely, I read it. I come across a line in a book and I stop. My mind goes blank. I’m blocked from thinking about anything except what I’ve just read. When that happens, I know I’ve found a book worth reading and an author worth following. What if you’re reading a collection of short stories from different authors and you experience that suspension of thought, that feeling of awe, for more than one author and more than one story? Maybe even more than once for each? Well, then you’ve just added two authors to your must read list. Yay! I love it when that happens. 6 Shorts: The finalists for the 2013 Sunday Times EFG Private Bank Short Story Award (amazon.ca / amazon.com), did this for me. 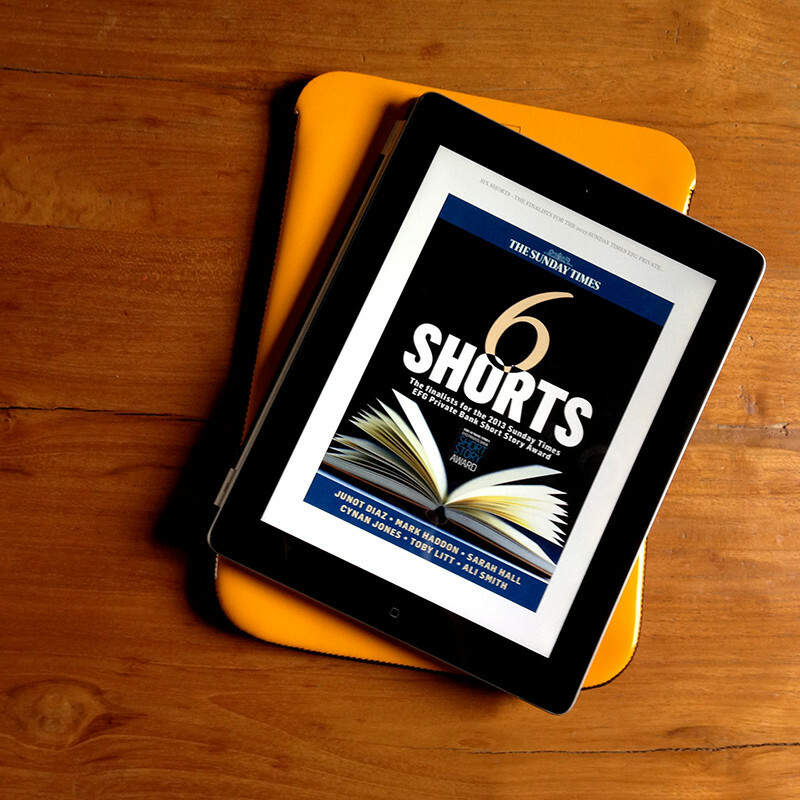 As the title implies, there are six short stories – by: Junot Diaz, Mark Haddon, Sarah Hall, Cynan Jones, Toby Litt, and Ali Smith. All are worth reading, but two of them stood out for me as gloriously beautiful. My favourite was The Gun, a story by Mark Haddon about two young boys in 1972 who find a gun one afternoon and what they proceed to do with it. I loved it. It transported me to the narrator’s childhood experience, and had me completely in its grip. I felt Daniel’s fear, horror, his inability to move away from what was happening, and his desire to be a part of it – danger, blood and all. I loved the instances of humour and adventure, the calm, honest truths of childhood that crept up in the text like little gifts, and the glorious writing that at times left me, quite seriously, awestruck. “That cathedral of silence before the first shot. Slabs of dusty sunlight.” Just beautiful. The Dig, a story by Cynan Jones about a boy who goes with his father on an early-morning badger hunt in the Welsh countryside, was my second favourite. Incredible, evocative, amazing for its compact vocabulary and intensity. The kind of story you think must be autobiographical because it is so vivid and true. Diving into these six incredibly well-crafted short stories makes me want to read more anthologies like this. Each one is different, with a different style and perspective. And with each one, I found myself thinking at some point, “Wow. I wish I said that.” That’s the other way I know I’ve stumbled onto something great. With 6 Shorts, I’m so happy I did. Thanks to Rob at Robaroundbooks.com, for his post that led me to this collection. Ninjas, aliens, and robot monsters – woohoo!